She achieved 238% of her July targets. She is always pro-active when it comes to helping the team to achieve 100% with one member down. She zones in on her tasks and gets them done efficiently. No, this is not a Marvel Comics character we’re talking about here, it’s shentongroup’s own Zoe Mitchell. 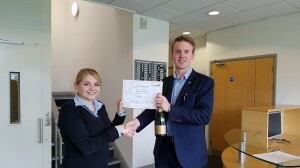 Zoe joins the esteemed ranks of shentongroup’s Colleague of the Month, which brings with it vouchers, a bottle of champagne and the sole usage of shentongroup’s Colleague of the Month parking space right here at Shenton House. The reason that we serve satisfied customer after satisfied customer is down to our team, their know-how and their outright commitment to quality service. If you’d like to find out exactly why shentongroup’s team is considered the UK’s Leading Technical Experts in Standby Power, Uninterruptible Power Supplies and Combined Heat & Power Systems, then click here to discuss your continuous power options now.